On arrival at Delhi Railway Station / Airport from there you will meet and assist by our representative and drive to hotel. On arrival check in to hotel. Rest of the day is leisure for you. Dinner & overnight stay at hotel. After breakfast at hotel proceed to local sightseeing tour of Delhi visit Red Fort, Jama Masjid, Qutub Minar, Humanyu's tomb etc. Evening came back to hotel. Dinner & overnight stay at hotel. After breakfast check out from hotel and drive to Agra (200 km /5 hrs). On arrival check in to hotel after taking some rest or freshen up proceed to visit The Taj Mahal (most celebrated monument of love) and The Agra Fort. Dinner & overnight stay at hotel. After breakfast check out from hotel and drive to Jaipur (235 km/ 5hrs). On the way you will visit Fatehpur Sikri. On arrival check in to hotel after taking some rest or freshen up than proceed to explore the colorful market of Jaipur also known as The Pink City of India. Evening came back to hotel. Dinner & overnight stay at hotel. After breakfast check out from hotel and drive to Bikaner (361 km / 6 hrs). 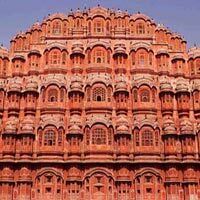 On arrival at Bikaner check into hotel after taking some rest or freshen up proceed to local sightseeing tour visit Junagarh Fort (built on plains unlike all major forts of Rajasthan), camel breeding farm and the famous 'Karni Mata Mandir' or the rat temple at Deshnok. Evening Came back to hotel. Dinner & overnight stay at hotel. After breakfast check out from hotel and drive to Jaisalmer (355km / 6-7 hrs). On arrival check into hotel after taking same rest or freshen up proceed to visit the man made Gadsisar lake & Vyas Chhatri ( Jaisalmer's only source of water for a long period ) and the royal cenotaphs at Bada Bagh. Evening came back to hotel. Dinner & overnight stay at hotel. After breakfast proceed to visit the City Palace (don't miss the awesome crystal gallery), Bagore ki Haveli, Saheliyon Ki Bari, Jagdish Temple, Pratap Smarak, Fateh Sagar Lake, Bhartiya Lok, garden of maids (it was orginally built for the maids of the queen who came along as wedding gifts), Kala Mandal & Shilp Gram. In the evening go for a boat ride in lake Pichola. Dinner & overnight stay at Udaipur. After breakfast check out from hotel and drive to Pushkar On the way to Pushkar you will visit Chittaurgarh & famous Dargah of Khwaja Muin-ud-din Chishti at Ajmer. Pushkar is known for its one of the very rare temples dedicated to lord Brahma (considered the creater of universe in Hindu mythology). On arrival at Pushkar check in to hotel freshen up and than proceed to explore the spiritual facets of this relaxed holy town Pushkar on foot. Dinner & Overnight at Pushkar hotel.